Since the 1970s, Zimbabweans have used the term “chimurenga” to refer to the 1896-1897 and 1960s-1970s wars of independence against the British settlers, but the concept has a much deeper meaning. First, it refers to the arts of war derived from Murenga – another name for Mwari (God) – hence chiMurenga, the way of Murenga, or spiritually guided warfare. Second, it is an approach to war involving the whole community, not just those carrying arms. Third, chimurenga is a transformation of zvakatikomberedza (environment – caves, mountains, rivers, pools, valleys, forests, animals, trees) into military assets and infrastructure, with or without physically modifying them. Chimurenga speaks for itself from multiple indigenous archives of deep chidzimbahwe that are also philosophies. 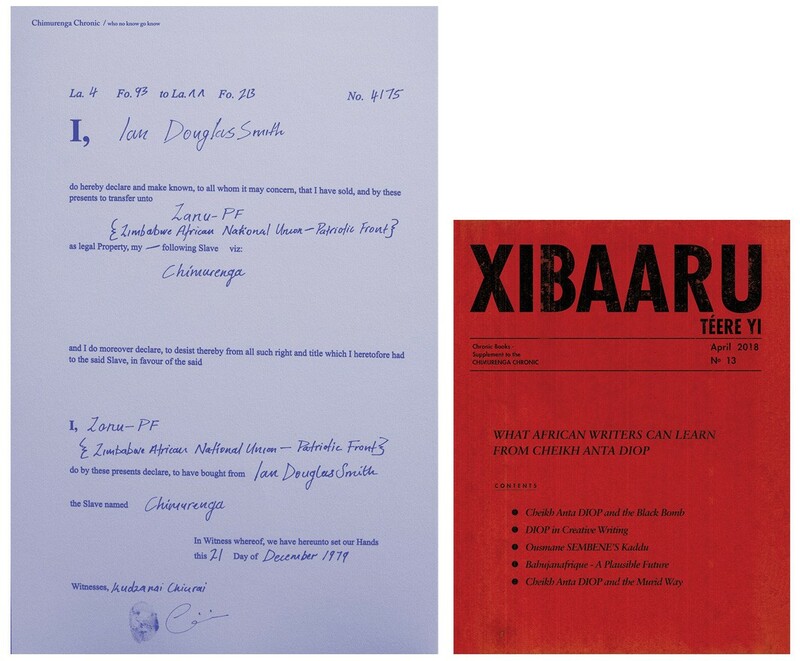 Yet, none of the literature on chimurenga grapples much with it as idea and laboratory. Instead, it is treated as a specific historical episode in which a few politicians liberated everyone else. Thus, in these politicians’ eyes, the ordinary people are ungrateful beneficiaries rather than combatants who fought using other weapons. By talking about hondo yekuzvisunungura (war of self-liberation), ordinary people insert themselves as agents in their own emancipation, reminding the elites about their own hefty sacrifices. Nobody was just sitting there while heroic, selfless messiahs were fighting to liberate them. Hondo yekuzvisunungura restores the idea of chimurenga as communal struggle, involving the ancestral spirits, the people, the guerrillas, and a leadership deriving its legitimacy from the spirits. The politicians never came to liberate the people; they came to liberate power for themselves and fooled the people – using the verbiage and spirit of chimurenga – into believing the ends were as communal as the means. Perhaps that is why it was so easy for the politicians to betray the values of communality in struggle, of hunhu, the philosophy that when one is hurting, everybody feels the pain, that the happiness of one amid a community in mourning is the antithesis of chimurenga. Chimurenga therefore has to be liberated from its perversion by opportunists. It must be repositioned for enquiry as a site of creative work that did not start in 1896 or in the 1960s. Seen as such, it becomes a space from which to make some critical interventions into the question of innovation. First, to explore chimurenga as laboratory (a site where creative work takes place), focusing on African modes of biological warfare; second, to place such innovation within the context of ancestral spirituality, which acts as an anchor and inspiration for all creativity. Recorded traditions say that vedzimbahwe (the Shona’s) ancestors came from Guruhuswa (the place of tall grass), referencing either the Nile valley (Egypt-Sudan) and later possibly the Niger-Congo region, or Tanzania. Early settlements emerged into a state system with prominent capitals at Mapungubwe (11th to 12th centuries), Dzimbahwe or Great Zimbabwe (13th to 15th centuries), and Kame (15th to 17th centuries). Later prominent dynasties include vaRozvi (1684-1834), Mutapa (1430-1760), and many other subordinate or independent chiefdoms in between. The historical genealogies of vaRozvi in particular are explicit about the role of Murenga in guiding these immigrants from Guruhuswa to Dzimbahwe. They say a voice called Tovela “led them on their way, keeping them safe from dangerous places, feeding them. The voice could speak from any object”, grass, trees, infants, even stones. It was the voice of “the founding father of the clan”, “the first person ever to be created.” that guided every single group out of Guruhuswa in many different directions. War was guided mobility. Nothing could be done without informing the ancestors first. Nedzimbahwe would place the ancestors in front just as they would in all journeys. After all, the soil the living walked on belonged to the ancestors. All masimba (strength or power) came from the ancestors, who in turn asked for it from the mhondoro (clan spirits), and them from Mwari, on the living’s behalf. As the keeper of makona (the clan’s war medicines), zimbuya guru (great ancestress), popularly known as mbonga or sviba, was the most important person in the community after the chief. In the presence of the mbonga, mhondoro, and Murenga/Mwari, the animals – four-legged, six-legged, or slithering legless – cannot be seen simply as nature, fauna, or species. They have a spiritual meaning and place in vedzimbahwe’s lives. It is the bird that Shona sculptors carved that archaeologists subsequently found at Dzimbahwe (Great Zimbabwe). When one sees chapungu, one sees vasekuru (grandfather), the ancestor. When chapungu circles above the home of a person struck by illness, the person recovers, a sign that the ancestors have refused to accept his spirit into nyikadzimu (the land of the departed ancestors) just yet. In its mobilities and acoustics is a message – a wing flap expressing happiness, a twisting somersault and fly-away warning of danger, or a sad, dejected shriek that portends one’s death or that of family. Chapungu usually appeared during – was indeed the bird of – chimurenga. By its flight pattern it warned warriors of danger or assured them, and it strengthened their resolve in combat. Chapungu, together with mhondoro and mbuyamuderere (praying mantis; literally “grandmother in okra”), and shato the python carriers, were embodiments and messengers of the ancestral spirits. Theirs was not a faunal presence, but a confirmation that the ancestors were present. To go alone into combat as mere mortals was umbimbindoga (reckless individualism); chimurenga was mushandirapamwe (communality of purpose) between vari kumhepo (those in the air – the deeper term for ancestors) and venyama (those of the flesh/mortals). The precolonial vedzimbahwe built their homesteads on hilltops and, to fight their enemies from the rocks, the arming of mountains was born out of thorough knowledge of the locale. Passes, caves, and highest points were known, with ambush positions carefully prepared in the camouflaged cliff overhangs of the passes below. The caves were turned into bunkers, stocked with provisions to sustain the occupants for several moons if necessary. The high points were turned into sentinel positions to spot the enemy from afar. The nharirire located on hilltops used things to signal approaching danger to the next hill: smoke during the day, a bonfire at night, and blowing a kudu horn where neither were visible. We can therefore begin a conversation about a chimurenga communication signal system long pre-dating contemporary modes of military signal equipment, codes and procedures. The communal spirit, the use of mountains and caves as infrastructures of defence, and the tactics that vedzimbahwe’s hostile neighbours the Ndebele called ukutshona (going under) were derived significantly from the vedzimbahwe’s observation of animals. Take mbeva (mouse), for example, the wild rodent that lives in mapani (valleys) and that vedzimbahwe trap, dig up, and eat. This widespread practice of kuchera mbeva – catching mice by digging up their mwena (burrows), which are very circuitous – served both as education about a potential defensive system and as a process of harvesting meat in the dry winter months. A dzimbahwe proverb states: Mbeva haicheri mwena usine mbudo (“A mouse does not dig its underground tunnels without an escape hole”). It always has an exit strategy. From watching baboons post sentinels on treetops and hills while the rest of the troop devoured crops in people’s fields, and seeing their careful stalking of animal prey spoiled by a warning “bho-o ho-o!” bark from such nharirire, vedzimbahwe coined the proverb “chati homu chareva” (“That which has barked has said something”). Animals did not just make “noise” or “sound”, they communicated, spoke a language to each other. They managed risk to themselves through posting sentinels and calling out warnings. Other animals also taught vedzimbahwe to evade their enemies through camouflage. They did it in a subtle way, behaving and looking opposite to what they were actually doing. This camouflage was one of two of the chameleon’s potent weapons, immortalized in the adage “kungwara kwerwavhi kusandura mavara arwo” (“The cleverness of chameleon to change its colours”). The chameleon became invisible to its prey, got behind a fly, remained motionless, then slowly advanced; when within reach, it darted out its tongue with astonishing speed. The fly vanished. There was no other teacher in the execution of speed and surprise in war, except perhaps shato (python), mesmerising with its variegated body colours, getting closer all the time, then – hla! – the victim was gone. Vedzimbahwe learned risk-management strategy from confrontations with a number of animals and immortalised them in language. From encounters with the leopard they learned the art of communal responsibility and the consequences of individualism and selfishness. Its spirit is summarised in the proverb “kuita muonerapamwe chuma chemuzukuru” (“Teamwork, the ethos of weaving the nephew or grandchild’s beads”) or, simply “mushandirapamwe” (the ethos of working together). “Hot pursuit” wasn’t always a wise military tactic; in fact, it could be a very stupid move. Vedzimbahwe knew too well that “chapinda kamwe hachiteverwi” (“What has entered once and never returned, cannot be followed”). That is something that everybody who has encountered mhungu (black cobra) and its nyamafingu (banded cobra variant) knows all too well. During my boyhood, I had countless confrontations with the snake. That is how I discovered that, upon entering a hole, the extremely venomous snake immediately turns its head outward, ready to defend itself. For snakes, holes in the ground are fortresses when fighting an enemy. Of course, snakes are also a source of muchetura (poison; literally “that which cuts to pieces”); in fact, most poisons used in Southern Africa contained snake venom. Sometimes, the entire snake was pounded into a pulp and smeared onto arrows, but the most common formula was to cut the snake’s head off, extract the poison glands, dry them, and pound them into powder. VaTsunga praise their clan as “vanofamba namago panyanga” (“Those who travel around with wasps on their horns”). Mago (wasps) were not just charms of war, but actual wasps carried in a horn. They would already be riled by the bumpiness of a journey, and vaTsunga cranked the venomous insects’ ire even higher by shaking up their containers. Then they offloaded them among their enemies. I know how it feels; I cannot recall how many times mago stung me. The scorpion was a weapon in war, a six-legged biochemical weapon. Lamentations to vaMhani’s ancestors speak of scorpions being thrown at people as a chitsinga (debilitating spell): “Chitsinga chamandindindi chinopisa chinovava chinoshunya chinoregerera waruma nyimo kwete mufemi, chinomonyorotsa pfungwa nendangariro, chinovava senduru yakarungwa mhiripiri” (A tough spell that burns and itches and pinches, that also lets go of one who has bitten the cowpea [died], not the one who still breathes, that churns the mind and memory, sour and hot like bile marinated with peppers). The use of insects to deliberately spread affliction, to win wars, and as instruments for torturing captives to extract intelligence, has been documented in other parts of the world. Indeed, so prominent is the role of insects in the history of warfare that Jeffrey Lockwood called them “six-legged soldiers”. Historian Lansiné Kaba tells the story of the army of Songhai, the most powerful West African kingdom of its time, which in 1591 tactically drew its Moroccan enemies into the mosquito- and tsetse-infested swamps of Tondibi on the Niger River. There it held the invaders off while the insects worked on them and their horses. The casualties were staggering. Chimurenga, or Murenga’s way of fighting, thus becomes a laboratory – a space replete with experimentation, application of ideas to practice, and practice generating new ideas. Vedzimbahwe are not simply receiving knowledge from animals; they are engaged in a cognitive and productive process – observation, experience, encounter and testing the (in)efficacy of various techniques. Trial and error might involve observing birds feeding on fruits, meaning the latter were not poisonous, and so people tried them. Animals going about their everyday lives became subjects of experiment, the equivalent of lab animals or test herds, except without people touching them. To that extent, one finds in chimurenga communalism, universalism, disinterestedness, originality, and scepticism. Knowledge individualised was dead. Vedzimbahwe did not write on paper; orality, language, practice and communality are what brought and kept information alive from generation to generation. Communality also became the mhenenguro (peer review) process through which wongororo (observations) and mashoko or mazwi (words; statements) were interrogated, corroborated, and canonised as tsomé or ruzivo (knowledge) or chokwadi (truth). Proverbs, tales, riddles, and other forms of dzimbahwe communication media were all outcomes of communal verifications and disproof over long periods of time. Vedzimbahwe exhibited humility to learn from animals big and small. Animals were no mere fauna or species, but indivisible from the human. In vedzimbahwe’s experience, we see the animal as an intellectual being, not just imbued with, but imparting, reason. In other words, vedzimbahwe were students to the animal. Did vedzimbahwe derive kutora mhuka sevanhu (treating animals as people; anthropomorphism in Western parlance) from the animals themselves, or did they map human characteristics specific to their society onto animals? It seems the answer is both. In any case, respect for the animal as a person or humanising other creations was much better than kubata vamwe vanhu semhuka (treating other human beings as animals) – the worst form of inhumanity in chidzimbahwe, and the project of European colonialism was exactly that. This suggests that it is impossible to reckon with the human or animal separate from each other. What happened when animals were taken away through arbitrary European colonial laws creating game reserves in 20th century Rhodesia? Poaching is always political – it is not merely about a craving for meat. To the local inhabitants, Gonarezhou National Park was ancestral lands from which they were evicted at gunpoint. Their shrines and ancestral burial grounds, the venue of the hunt, and multiple forest resources they had relied upon, were now behind a fence. In circumstances like these, poaching became a political critique through defiant action. The forest was a sacred space; it belonged and would always belong to the ancestors. MaTshangana and vaShona around Gonarezhou had felt this way since before the declaration of the proposed game reserve, during the time when district commissioner Allan Wright was ruthlessly disarming them of their guns. It was then that an important event happened: the national ferment of resistance against colonial rule merged with local grievances, turning poaching into a transient workplace of anticolonial resistance. It started far away from Gonarezhou, in the cities of Salisbury, Bulawayo and Umtali. Invoking the emergency provisions of the Law and Order Maintenance Act (LOMA), Prime Minister Ian Smith had ordered that the entire top echelon of the African nationalist movement be arrested and squirreled away to very remote places, far from the cities where they were inciting urban Africans to violence and acts of civil disobedience. This followed an escalation of clashes involving the two major nationalist parties, ZAPU (Zimbabwe African People’s Union) and ZANU (Zimbabwe African National Union). Having peacefully agitated for independence, these nationalists were alarmed that, instead of granting independence, the white minority regime was instead moving toward declaring independence from Britain and remaining a white governed republic. The gloves came off. Joshua Nkomo, leader of the now banned ZAPU, was one of those arrested in a pre-dawn raid on 16 April 1964, along with his deputy Josiah Chinamano, his wife Ruth, and countless others. They were flown to Gonakudzingwa, one of several designated “restriction camps”, to cool off. They were thrust into the middle of an ongoing struggle between Chibwechitedza and local maTshangana over Gonarezhou’ s forest resources. This was a period in which indigenous institutions were extended to serve as spaces for purveying, hosting, and executing resistance against the colonial settler state. Inevitably, hunting would not be the exception to general politicisation. Records maintained at Mabalauta Field Station indicate that from 1965 to 1980 saw sustained poaching in Gonarezhou. Mapocha had a very efficient weapon maintenance and production system in place. Ironsmiths (including those that were also mapocha) were not only repairing guns, but also producing replicas. They ran their own network to monitor the whereabouts of park patrols and animals. The fences that the state meant as boundaries between villages and the game reserve created new hidden highways for mapocha. Kinship-related poaching connections also cut across the border between “Rhodesian” maTshangana and “Portuguese” maTshangana. Patriarchal structures and communalism formed the foundations upon which military-style hierarchy and socialist collectivism were made standard operating procedure. Locals did not come to their own struggle for liberation as spectators. All journeying, hunting, fighting – life itself – could only be possible if it was spiritually guided mobility, hence the imperative to pray (kupira midzimu) and to ask for guidance (kutungamirirwa) when embarking on journeying and to thank the ancestors after arriving safely. ZANLA actually had a svikiro-in-residence at its operational bases. As makomuredhi deployed to a new war theatre, they received instructions to head to a specific svikiro (spirit medium), whose mhondoro (lion spirit) would guide their local operations. Throughout the war of independence, makomuredhi were believed to possess the supernatural power to “mystically disappear when confronted by the Rhodesian forces” or “change into lions or chameleons… or even vanish into thin air”. The act of becoming invisible involved calling ancestors to conjure the escape by measuring a portion of buté [snuff] and placing it on the ground for the ancestors. Then, as the enemy’s guns blazed, komuredhi beseeched the ancestors to guide him out to safety. Ex-makomuredhi will swear that the mhondoro transfigured them into forms invisible to the enemy. To fight the coloniser often meant having to live not only like animals in the forest, but also with animals of the forest, sharing caves with dassies, hiding in pools with crocodiles and sleeping in trees, sometimes even with leopards. These are the times when maTshangana and vaShona’s notions of animals as spiritual(ised) beings came to the fore, and when life as guided mobility was ever so apparent. Makomuredhi who saw combat say they never fought alone, as mere vanhu venyama (people-of-flesh), but as spirit(ual) beings, always under the wing of mhondoro. The local struggle was no struggle in the abstract, or simply a national cause; it was the latest episode of a long-running saga pitting a people aggrieved about the loss of their lands and animals against a state that criminalised their access to that heritage. The nationalist message gained traction locally through the social networks of kinship, which served as information highways. From Gonakudzingwa or the rally at Chikombedzi, the word was carried in person to the villages, where it was disseminated at spaces like padare/ huvo, at beer parties and nhimbe, at games like dhema, during firewood gathering, at chinyambela, at wells, and whispered in the bedrooms between husband and wife at night. The indigenous structures of knowledge production and practice became vibrant sites of discussion and organising toward the birth of a new political order. Such were the transient workplaces of anticolonial organising, places where we seldom look when thinking about nationalism or, for that matter, when describing the work of nation building.